Spacing: 2 - 3 inches. Color: Red and White flowers. Foliage: Clover-like leaves, linear, slender and green. Blooms: Mid to late summer , 8-10 weeks from planting. Pruning: Late in the summer the leaves will yellow and die back as the plant slips into dormancy. Foliage many be removed at this point. 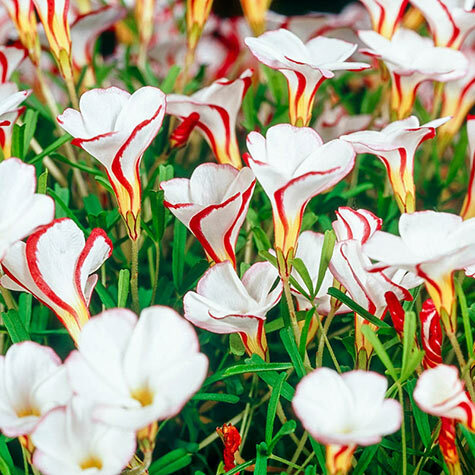 Your oxalis will rest for a few months before beginning the next growing cycle. Comments: A most adaptable plant which forms lovely mounds of cloverlike leaves with 5 petaled flowers that open wide in the sun. Lovely swirled white flowers edged in raspberry red. Excellent for Alpine and rock gardens. Can be grown indoors. If you ordered the bulbs and live in a zone colder than zone 7, you will need to plant them indoors and treat them like a houseplant. These bulbs will not need chilling when planting indoors.